Special Care: Chronic Sinusitis Sunkist is the cutest, silliest, funniest boy who loves to play and entertain. He is quite active and mischievous. He likes toys and loves to chase the broom when you sweep. He gets along very well with other cats. He loves treats. So why has he been in foster care for over a year and a half? In January of 2016, he was just a half grown kitten pulled from a high kill shelter. He came to us with a severe sinus infection where he was sneezing blood. He was treated with multiple courses of antibiotics but every time he came off of antibiotics he would start sneezing and eventually would develop sinus and respiratory infections. We tried different antibiotics and extended courses of antibiotics, but Sunkist could never stay well for long. He was even seen at the vet school but there has been no cure found for him. His infections are not contagious and are caused by damage in his sinuses from when he was a kitten, so he will always be susceptible to infections. He will periodically need antibiotics and steroids. Despite all of this he is a happy boy that would love nothing more than a real home for the first time in his life. He is not a placid lap cat because he is so busy all of the time. He would love a family with older kids or other cats to play with- maybe even a dog! He is stuck in foster care through no fault of his own. 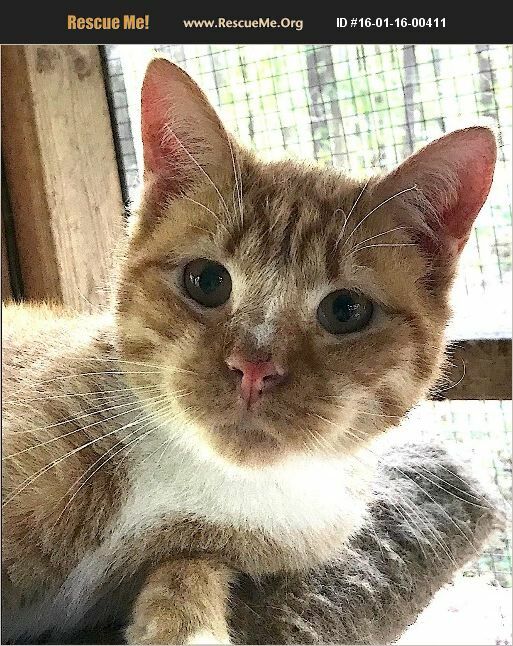 We have found homes for cats with many different medical issues before, and we know that there is a home out there for Sunkist. Could it be you that will open your heart and home to this deserving boy?